may 16th, 2009 marked my one-year holgaversary. i ordered my first holga (my first "as-adult" film camera) on may 16th, 2008.
i missed my one year flickr anniversary (april 26th, i think) and the one year anniversary marking my mom buying me, as an early b-day present, the canon powershot s5 (maybe early feb, 2008? ), so i was glad to actually remember and mark the holgaversary by going out and taking a few shots with the holga. i'm frankly amazed that the canon powershot led to the events and the enjoyment i've experienced over the past year. and i recall so vividly, when my mom offered to buy me the powershot, i felt it would be a fairly ridiculous expense. I aleady had a decent digital camera--not one that i ever really liked using--but it served well for research purposes. and the only photos i took at that point were images of student work. but my mom had bought herself another canon digital camera and i was testing it out to teach her how to use it. it was such a hoot to work with, i couldn't stop using it and trying new things. she kept saying, "okay--do you want that one and i'll get myself another?" i really didn't. her camera was fun to use but i already had one and it served me well for my research and scholarship. she offered to buy me my own camera a few more times that weekend. like i said, it was hard to stop taking pics with it once i started. i knew i wanted something with more manual controls, so we ended up going out and looking around and i settled on the powershot s5. so about diana+. wow. what a rough time this has been. when things work between us, they are amazing. 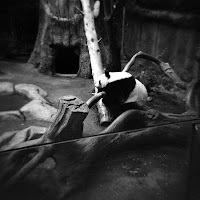 the panda photo from the san diego conference trip is still one of my all-time favs. problem is, most of the time we don't work or play well together. ah, diana. as for favorite films: hands down, for b/w it has got to be adox chs art (120 or 35mm) and efke kb 400 (35mm). the holga train station image above was taken with adox chs art 100.
what i'm not digging: surprisingly, higher speed films. ilford delta 3200, even the fuji 800 speed films. i thought i'd really like working with the higher speed films--color especially--but i've just not been feeling it. some 60-70 cameras (yikes) later, i have to say that the camera i am most glad that i bought (and i say this only because i was going to pass on it) was the ultronic panoramic. i actually picked up two at resale shops when i went home for easter. that the camera was only a buck is pretty amazing. i was incredibly amazed though when i saw the images it was capable of taking. wow. i'm really, really glad i didn't pass on this one thinking that because it looked like junk the images would be junk--and not the interesting kind of junky i really love. what i imagined i'd be doing more of at this point in time: most definitely, pinhole photography. i picked up a 35mm zeroimage and i really, really liked working with it. 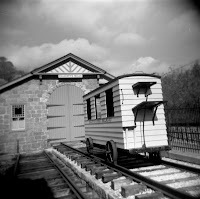 my plans were to spend this spring and summer getting into 4x5 pinhole photography. i figured that i'd go with another zeroimage as soon as i saved money for that and for the 4x5 tank, film, etc. that i agreed to start volunteering my time taking pics of rescued animals, animals needing homes and of so many, many pitbulls, kind of put the brakes on the pinhole plans. what i've most enjoyed doing: most definitely, buying cameras and seeing if i'll be able to flip the lenses on them without breaking the cameras or shutters or lenses and without hurting myself. thanks again to folks on flickr and the incredible resources to be found there, my first flip was with the brownie hawkeye flash. 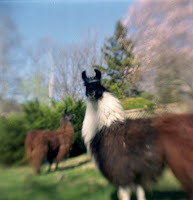 --along with the ultronic, holga, and zenit em, this has definitely been one of my favorite cameras with which to take photographs of llamas in the springtime.